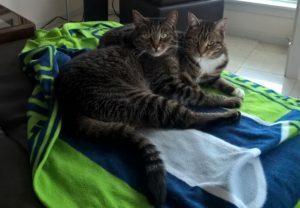 Meet Queen Anne Animal Clinic’s Pets of the Month: Abby and Eddie! 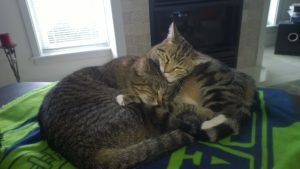 Abby and Eddie are two cats who were adopted after they were transferred from a rescue in Yakima that was overrun with kittens to a rescue here in Seattle who was more than happy to introduce these two country kitties to city life. Their future owner found them there and even though they are not siblings they were already extremely bonded so she took them both home! As kittens they discovered the pleasure of hanging out on the top level of the kitty condo together, snuggling and enjoying the view of their new home. Now that they’re older (and bigger!) they still like to cuddle up there but it’s a much tighter fit. These two are still very close, even as adults. Their owner says they are very sweet cats and she’s so glad to have them in her life.